High expectations for May 2017 Post-War & Contemporary sales in New York. At the time of publication, the total value of Wool’s works (based on 7 lots) consigned to upcoming Post-War & Contemporary art sales at Sotheby’s, Christie’s and Phillips in New York in May 2017 was $19.9 million (based on the low estimate). Suggesting high expectations for Stingel’s market in Q2 2017. With an estimated average value of $2.8 million per lot for the upcoming sales compared to $2.7 million in average value for sold lots in May 2016. A positive start to 2017 with sales up 473% on the first quarter of 2016. 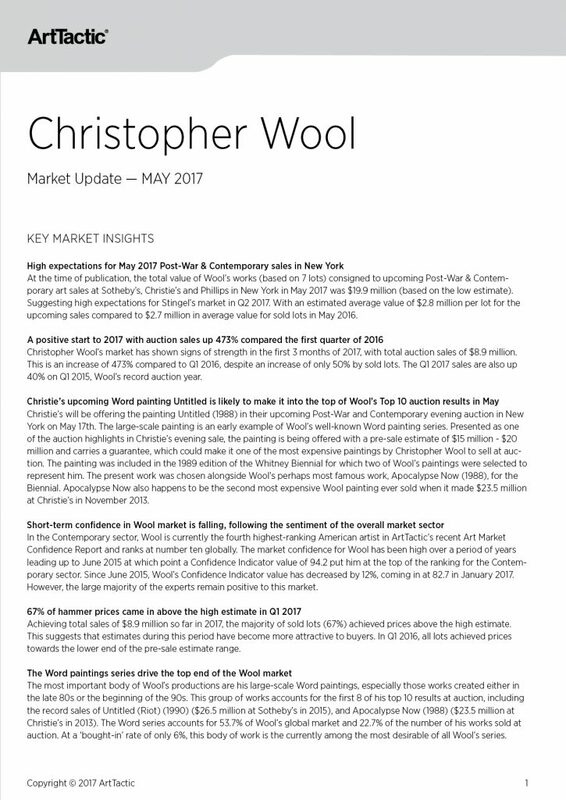 By the end of 2016, Wool’s total auction sales for the year amounted to $45.5 million, down 53% by value from the artist’s market peak in 2015. Wool’s market is indicating signs of strength in 2017, with total sales in the first quarter of the year at $8.9 million. Q1 2017 sales, in comparison to Q1 2016, have increased by 473%, while only increasing 50% by sold lots. Compared to Q1 sales in 2015, sales are up 40% so far this year. This Market Update follows on the Wool Market Report published by ArtTactic in October 2016. TOTAL SALES AND AVERAGE PRICES 2006-2017, INCLUDING INFORMATION ON UPCOMING MAY AUCTIONS IN NEW YORK. ARTWORK SERIES FOCUS: WORD PAINTINGS.